BANGKOK — Shares were mostly higher in Europe on Monday, tracking gains in Asia as investors awaited further developments in trade talks between the U.S. and China. Boeing shares were predicted to fall at the open on Wall Street after the crash Sunday of a 737 Max 8 plane in Ethiopia that killed all 157 people aboard. Much of the interest in markets this week will be on Britain, where the Brexit process is supposedly reaching its end-game. Britain's FTSE 100 gained 0.6 percent in midday trading to 7,148 as Prime Minister Theresa May battled to stave off a fresh defeat for her proposal on the divorce from the European Union. Talks were deadlocked a day before Parliament was scheduled to vote on the plan. Should her plan fall, then lawmakers are scheduled to vote on whether they would like the country to leave the EU without a deal or to seek a delay from the current Brexit date of March 29. The British pound was holding its own too amid the uncertainty, hovering around the $1.30 mark. "Brexit jitters are setting in ahead of a series of Brexit votes starting tomorrow," Jasper Lawler, head of research for London Capital Group, said in a commentary. "With Theresa May's deal now an almost certain failure, pound traders are concerned about what actually comes next. A delay is looking like the most likely outcome." Elsewhere, Germany's DAX edged 0.2 percent higher to 11,484 and the CAC 40 in France rose 0.2 percent at 5,240. Wall Street looked set for a mixed start, with the future contract for the Dow Jones Industrial Average down 0.6 percent to 25,378. Futures for the S&P 500 gained 0.8 percent to 2,754. On Wall Street, shares in aircraft manufacturer Boeing Co. will be in focus following Sunday's deadly crash. With aviation authorities in China, Indonesia and Ethiopia ground the Boeing 737 Max 8 planes indefinitely, there are worries over the company. Pre-market trading suggests that Boeing's share price will fall by more than 9 percent. Speaking on the sidelines of the annual legislative session on Sunday, China's central bank governor, Yi Gang, gave no indication China and the U.S. had reached a consensus beyond previous commitments produced by meetings of the Group of 20 major economies. Yi, who attended the latest round of talks in Washington, reaffirmed official promises not to manipulate China's currency to boost exports. He said the issue was discussed in those talks, which are aimed at ending a conflict over Beijing's technology ambitions that has led both sides to raise tariffs on billions of dollars of each other's goods. 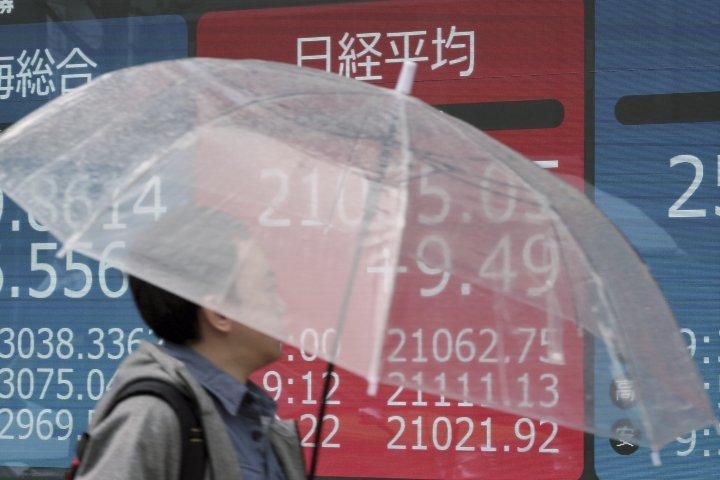 The Shanghai Composite jumped 1.9 percent to 3,026.99 and the Hang Seng in Hong Kong gained 1.0 percent to 28,503.30. 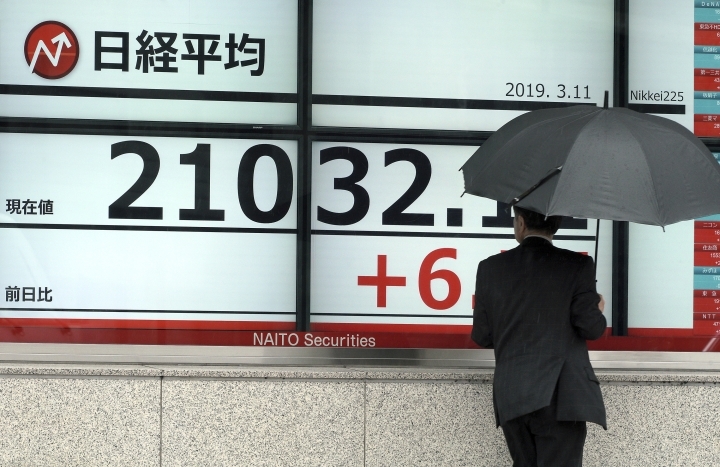 Japan's Nikkei 225 index added 0.5 percent to 21,125.09 and the S&P ASX 200 in Australia slipped 0.4 percent to 6,180.20. 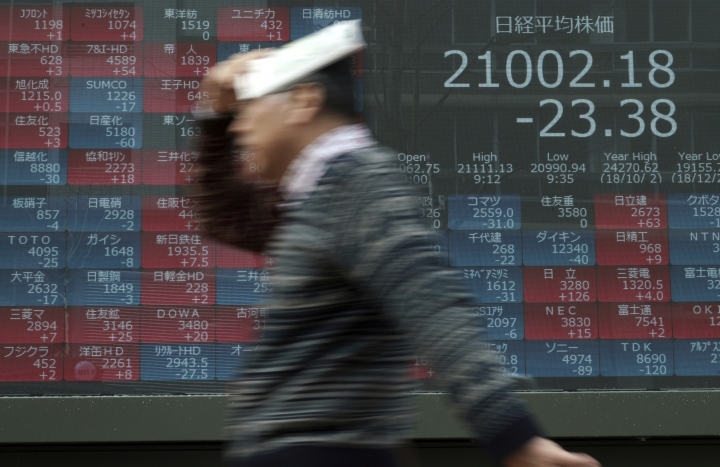 India's Sensex surged 1.1 percent to 37,071.03 while South Korea's Kospi was flat at 2,138.10. ENERGY: Benchmark U.S. crude oil gained 32 cents to $56.39 per barrel in electronic trading on the New York Mercantile Exchange. It lost 59 cents to $56.07 per barrel on Friday. Brent crude, the international standard, gained 40 cents to $66.14 per barrel. It lost 0.8 cents to close at $65.74 per barrel on Friday. CURRENCIES: The dollar rose to 111.20 yen from 111.17 yen on Friday. The euro strengthened to $1.1242 from $1.1230.